Neighbors who live just a couple of doors apart in the 900 block of Newport reported intruders in their third floor apartments last week. One case was weird. The other resulted in a battery. The incidents are just the latest in a series of unusual activities on the normally peaceful block. Friday evening at 5:45PM, an 87-year-old man heard a scratching sound on his third floor apartment door. He opened the door and found a complete stranger on the other side. The noise woke up the older man's roommate. "When I ran to he door and asked [the stranger] what he wanted, he just laughed. He shoved me on the floor, spit in my face, and said, 'now you have AIDS.'" The offender then ran down the stairs and out the front door, which the victim later learned had been kicked in. The intruder is described as a black man in his mid-20's with red hair on top and dark blonde hair on the sides. He stands about 6'2" tall. In a separate incident just three doors away, a third-floor resident called police at 9:00PM on July 26 to report that an unknown man had walked into his apartment. When he asked the intruder what he was doing, the man said he was "chasing a butterfly," then fled. That suspect was described as a black man, about 6-feet tall, 190 pounds. He was last seen heading westbound carrying a black backpack with a red neon stripe on it. The normally quiet 900 block of Newport has seen more than its share of incidents lately. Earlier on the day of the "butterfly" incident, a man was beaten and robbed as he returned to his 3-flat across the street. 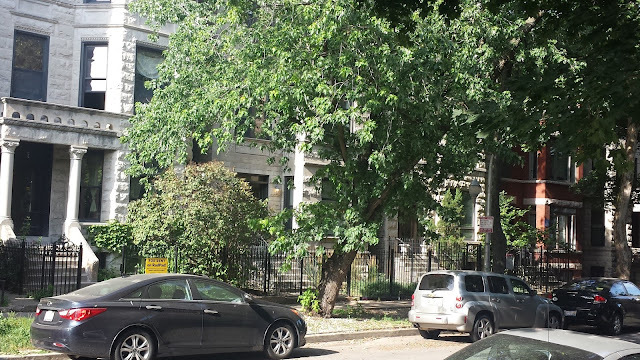 On July 19, a man who had been robbed in Wrigleyville four hours earlier traced his pinging cell phone to a three-flat just a couple of doors away from the other robbery victim's home. The phone was never recovered. Photo: A line of 3-flat homes in the 900 block of Newport.